Film-induced tourism becomes a new emerging issue in tourism and scholarly research for the last 10 years. London’s “Harry Potter” series and New Zealand’s “Lord of the Rings” are among the best practices of the trend. On the other hand, Indonesia is a country with many beautiful places to visit by both local and international tourists. The number of visitors increases significantly every year. 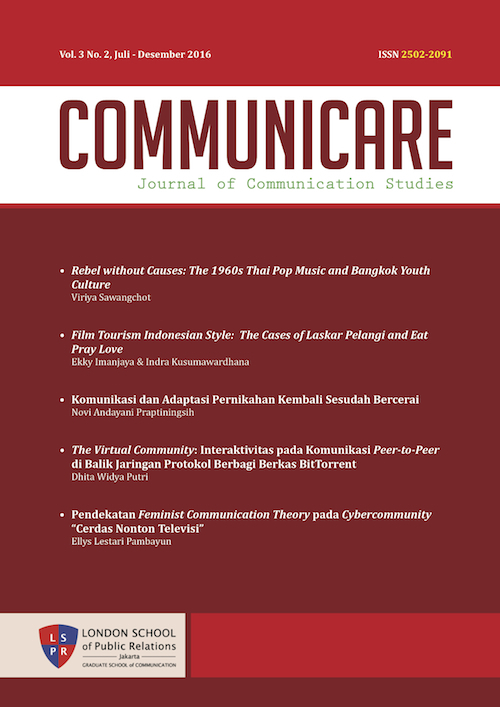 However, there is no contribution from film industry, both from local or international production, related to this increasing numbers of tourists, not before national movie production “Laskar Pelangi, 2008” (Rainbow Troops, 2008) by Riri Riza, and international box office movie production “Eat, Pray Love, 2010”. The study research will discuss about film induced tourism issues in Indonesia, particularly on why and how the two films--so far, until recently, only those two films--became phenomenon in film tourism--and why other films did not. KUSUMAWARDHANA, Indra; IMANJAYA, Ekky. Film Tourism Indonesian Style: The Cases of Laskar Pelangi and Eat Pray Love. Communicare, [S.l. ], v. 3, n. 2, p. 9-28, mar. 2018. ISSN 2502-2091. Available at: <http://journal.lspr.edu/index.php/communicare/article/view/17>. Date accessed: 18 apr. 2019.